Pandemic 1918 is the story of The Spanish Flu and the devastating effect it had during the early 20th century. This was a harrowing read. Aside from a passing mention in Dennis Lehane’s “The Given Day”, I’ve been exposed to very little of the devastation caused by the Spanish Flu. It was an absolute monster estimated to have killed upwards of 100 million people worldwide (between 3 and 5 percent of the total population) and dealing a lasting generational effect for years to come. Catharine Arnold’s book acts as sort of an aggregator in that she compiles countless recollections from those that lived it – sort of like those “oral history” books that have been enormously popular recently. The difference here is that Arnold carefully guides the reader through much of the chaos in pointing out the glaring mistakes made by those with the power to help hinder the procession of the disease. Looking back, given that it struck during the dying days of the first World War, governments had to walk the line between lifting morale and keeping the population safe. It also did not help that many were in complete denial about the severity of the flu until it was too late. During the latter half of 1918, which is the bulk of the book, an even deadlier second wave decimated millions. The stories of the soldiers trying to survive the lethal flu while also battling the horrendous injuries and conditions brought on by war were heartbreaking. Even before reaching the battlefield, the soldiers would have to risk catching the virus traveling from North America to Europe aboard steamships. One particular crossing was told in detail when nearly one hundred recruits died and over two thousand fell ill while traveling in the massive USS Leviathan. Bodies were tossed overboard, without ceremony, just to clear the ship of the dead. It goes without saying that here in good ol’ 2018, we take for granted just how accomplished we’ve become as a society in treating and preventing illnesses (at least here in the first world). It was only one hundred years ago that researchers and doctors were scrambling to find an effective treatment as the corpses piled up around them. That isn’t to say that we’re well-prepared for a pandemic today, should one occur. Near the end of the book, Arnold details the bird flu that struck China in the late 1990s and the near outbreak that occurred. Panic nearly caused preventative measures to go off the rails yet again – so it’s hard to predict if we’ll be ready today. 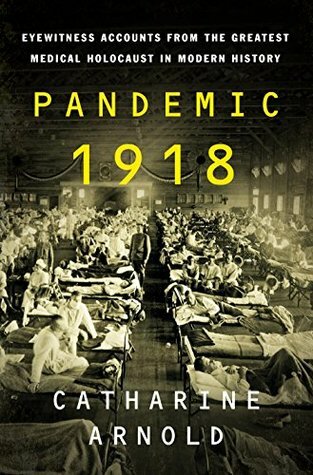 Pandemic 1918 is both an informative and terrifying read. The author notes that this particular chapter of human history has been more or less forgotten; which I suppose helps to explain why I barely knew anything about it. I highly recommend this one and although it took me the better part of a week to finish it, it was painful to have to put down.